The LFV70 Series is equipped with digital signal input terminals of two DVI-D, HDMI, DisplayPort, DIGITAL LINK, and USB. 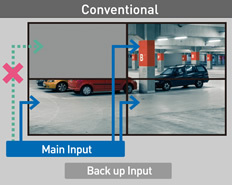 If the main video and audio signals are interrupted, the system immediately switches to alternative signals. This makes it ideal for mission critical control rooms and surveillance centers. If the main display signal is interrupted, the image is simply cut off. 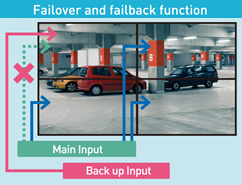 Even if the main display signal is interrupted, the system switches to a back-up signal, so the image is not cut off. The optional Installation Mount makes it much easier to configure a video wall. There's no need for complicated display positioning, and fluctuations between installers are covered. It also saves time and cuts labor costs. Video wall fluctuations occur when the bezels are not correctly aligned vertically and horizontally and the surfaces are not properly adjusted. Installation is quick and easy using the rigid frame, with easy adjustment using surface alignment magnets. This structure also makes the displays easier to remove when performing maintenance. Simply connect USB memory sticks containing still contents files to a 2x2-unit multi-screen configuration for easy synchronized 4K signages. 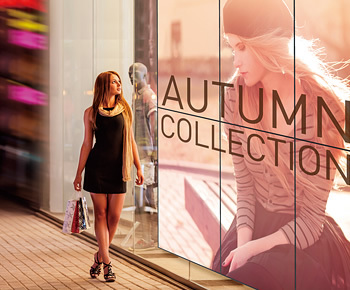 Color differences can develop between displays as time passes after multi-screen installation. This new calibration software supports sensors that are sold by a variety of suppliers. It lets you adjust colors while using your existing calibration sensor. The color is adjusted on the LFV70 Series when it is shipped from the factory so there is no adjustment necessary during installation, which greatly shortens the time required for multi-screen installation. Color differences between the displays are also suppressed in order to display natural-appearing images. *In some cases, visual adjustment is necessary during multi-screen installation. The ultra-narrow bezel results in joints that are only 3.5 mm (0.14") wide for video wall installations. Even in large-screen configurations, the screen borders can barely be seen, so images are powerful and natural.